The DefExpo 2018 event held in Chennai from April 11 to 14 demonstrated the ambition of India’s burgeoning defense industry, boosted by the growing involvement of the private sector. This was the 10th such biennial show organized by the Indian defense ministry, which claimed that there were 677 exhibiting companies. Notably, though, the proportion of these that were foreign again was reduced from previous years. The focus of the show has been steadily shifting from direct foreign purchase and license production of defense equipment to co-development and joint production in accordance with the government’s “Make in India” policy. Reflecting this, all the full-scale exhibits were of local origin or assembly. Defense minister Nirmala Sitharaman emphasized the government’s intention to further increase domestic production, and also to encourage defense exports. 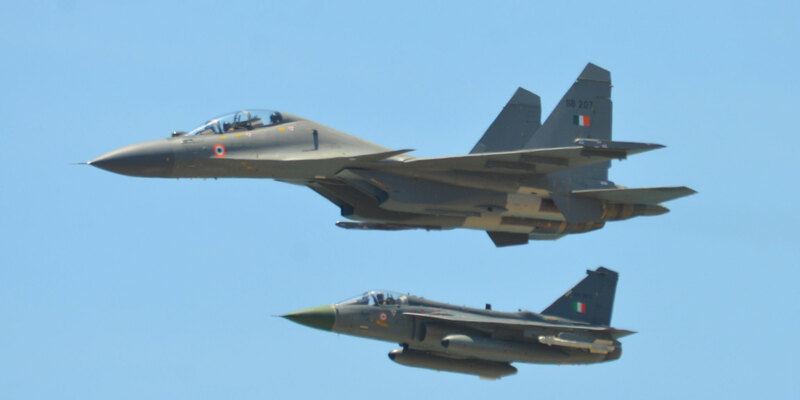 The flypast of the HAL Tejas was very relevant in view of the newly declared plan to eventually buy 324 such aircraft for the Indian air force, enough to equip 18 fighter squadrons. The service is committed to buying 123 with induction in 2019. This would unseat the Sukhoi Su-30MKI, with 272 copies in service or under assembly at HAL, as the most numerous fighter jet in the Indian inventory. With a maiden flight in May 2016, the HTT-40, dubbed the Hindustan Turboprop Trainer, was demonstrated in public for the first time at DefExpo. The manufacturer described it as a “fully aerobatic tandem seat trainer” with almost 50 percent of parts manufactured by the private sector. Powered by a single Honeywell Garrett TPE331-12B engine, the aircraft accelerates to 400 knots and has a range of 1,000 km. India’s Defense Research and Development Organization (DRDO) displayed some of its achievements, notably the indigenous Airborne Early Warning and Control (AEW&C) surveillance system. Two such aircraft based on the Embraer EMB-145 regional jet as the platform, are now in service with the Indian air force. Building on that success, DRDO is working on the much larger AEW&C on the Airbus A330 platform. The newer aircraft would be similar in size and performance to the Russian-made Beriev A50EI AWACS aircraft equipped with Israel’s Elta EL/W-2090 Phalcon radar, three of which are in Indian service and two more being built. DRDO also displayed three scale models of its proposed Advanced Medium Combat Aircraft (AMCA) development. This was described as “a multirole twin-engine fighter” and attributed to the fifth generation. The AMCA features an internal weapons bay in the lower part of the central fuselage for four air-launched weapons, in addition to six underwing and two under-fuselage weapons pylons. DRDO is also working on an AESA radar for fighter jets labeled “AAAU.” A full-scale demonstrator was on display at DefExpo 2018. Judging by its size, this unit is intended for installation on the Sukhoi Su-30MKI as a replacement of the factory-standard passive phased-array radar. Other notable exhibits on display included a scaled model of a UCAV with jet propulsion and sharply swept wings and the Rustom-II MALE UCAV powered by two engines driving three-blade tractor propellers.